If you’ve followed for a while, you know I have a soft spot for Costco. 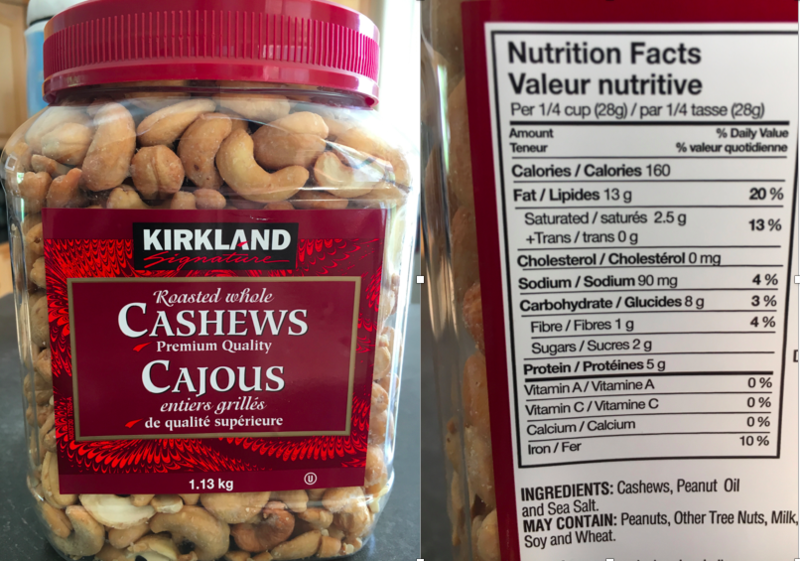 Last year I posted the Costco favourites of twelve Calgary dietitians, and I usually brave the crowds to stock up for my family at least once a month. A few Costco foods, however, make my pet peeve list. I’m not talking about giant tubs of brownies or cases of pop. If you’re buying those, you’re doing it for enjoyment vs. health, and that’s your prerogative. I’m talking about foods that entice you to buy with their health appeal but aren’t all they’re cracked up to be. It’s called “healthwashing.” They distract you with words like “natural,” “trans-fat free,” or “gluten-free.” They highlight acai, whole grains, or other purported “superfoods” (a marketing buzzword if there ever was one). If you’re after something healthy(ish) in a package, you really have to get your reading glasses out and take a closer look at what’s actually inside. 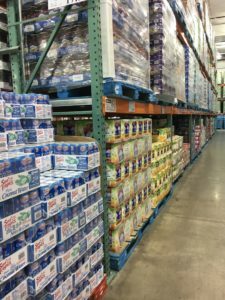 One of the most notorious examples was mentioned in my original Costco post: Veggie Straws. 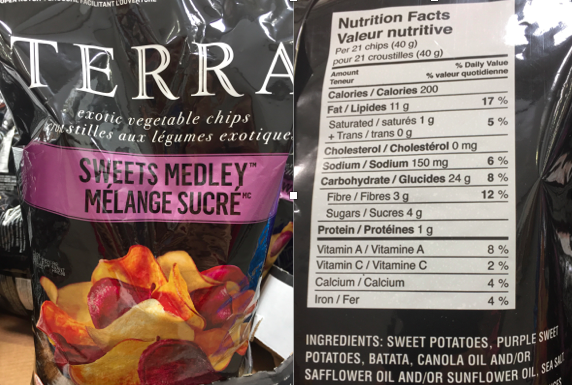 Since they’re made of veggies, like the superfood-y sweet potatoes featured on this package, and have “no artificial flavours, colours, or preservatives,” they must be okay, right? You know they’re not carrots, but they must be better than potato chips, right? Wrong. Sorry. How can you tell? Well, look closely at the ingredient list, below on the left. Don’t be distracted by the sweet potato (flour) and spinach (powder). 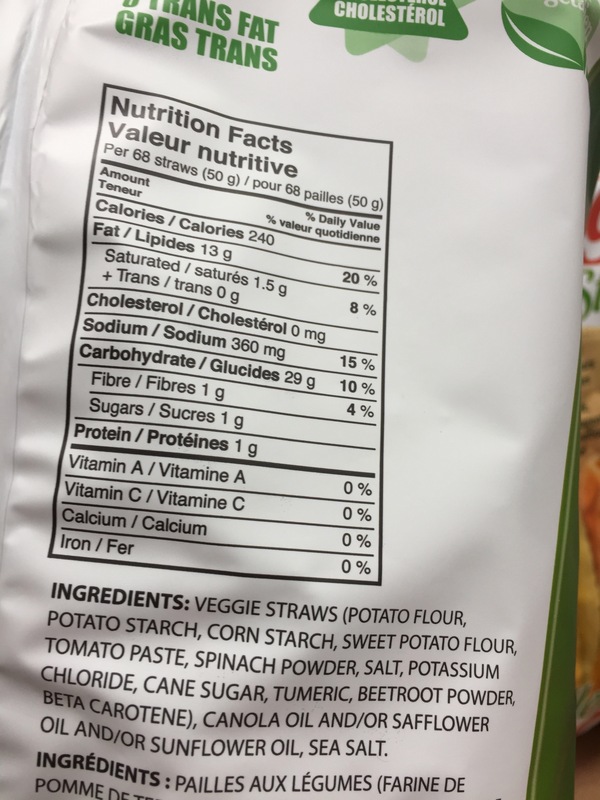 The ingredients are in order by weight, and the first three in the Veggie Straws are potato flour, potato starch, and corn starch. What do you make of that? 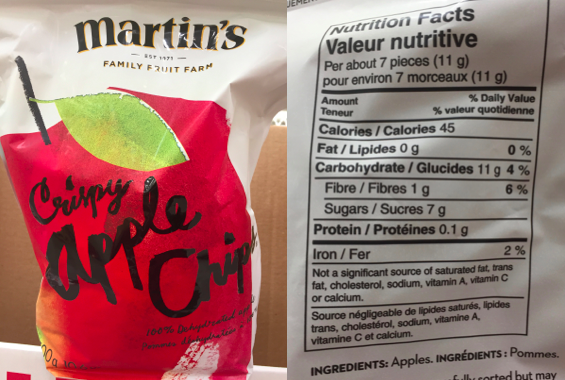 Even regular old potato chips list actual “potatoes” as their first ingredient. Compare the nutrition (click to enlarge if needed). The potato chips win on every measure! Remember those sweet potatoes on the front of the package? (It’s sweet potato flour, for the record.) Sweet potatoes are a great source of vitamin A. 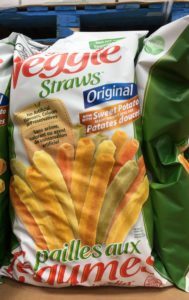 Just 5g (about a teaspoon) of actual sweet potato would give you 4% of the daily value of vitamin A, but this 50g serving of Veggie Straws has 0% vitamin A! That tells you there’s very little in there. Kind of misleading, isn’t it? If you love Veggie Straws and want to buy them at Costco occasionally, go for it. But if you’re choosing because you think they’re healthier than potato chips, let’s dispense with that illusion. Any way they make them, chips aren’t health food. Could you satisfy that salt craving with a handful of crunchy cashews instead? This serving size is smaller, but even if we scale it up, it will be less sodium, as well as more protein, fibre, and iron. What you can’t see on the label are the potassium, magnesium, vitamin E, and more. 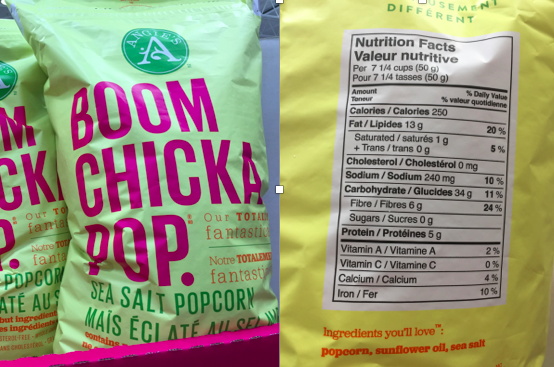 Another alternative is Angie’s Boom Chicka Pop (sea salt flavour). A full seven cups worth gives you about the same calories as the 68 Veggie Straws, but with six times the gut-friendly fibre, as well as more protein and iron, all with less sodium. One more option: apple chips. The only ingredient is apples! Yes, fresh apples would be better, but I’m assuming here that you’re on the hunt for a snacky treat. 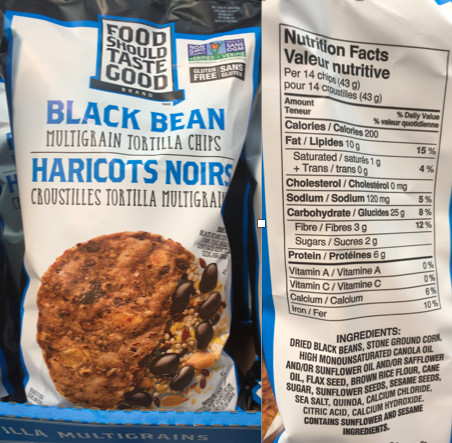 If it’s chips you want, just about any would be better than Veggie Straws, but these Black Bean Multigrain Chips are one of the (relatively) healthier chips I could find. 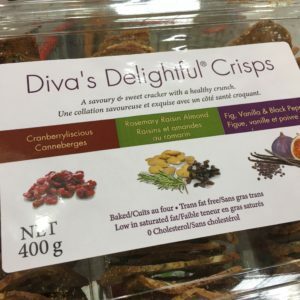 Unlike everything else I suggest in this post, I haven’t tried them, so I have no idea if they’re palatable. Also better is this Terra Sweets Medley, with at least a little bit of sweet potato’s vitamin A and fibre. And those I know are delicious. 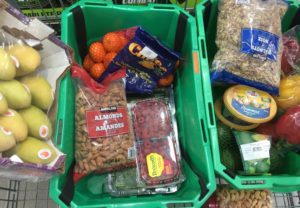 Buy your mangoes and fish at Costco if you like, but consider sticking to small packages for treats you might find hard to resist, from chips to cookies to chocolate. Take a quick look at this package and tell me you don’t expect acai berries and blueberries to be in it. I certainly did. 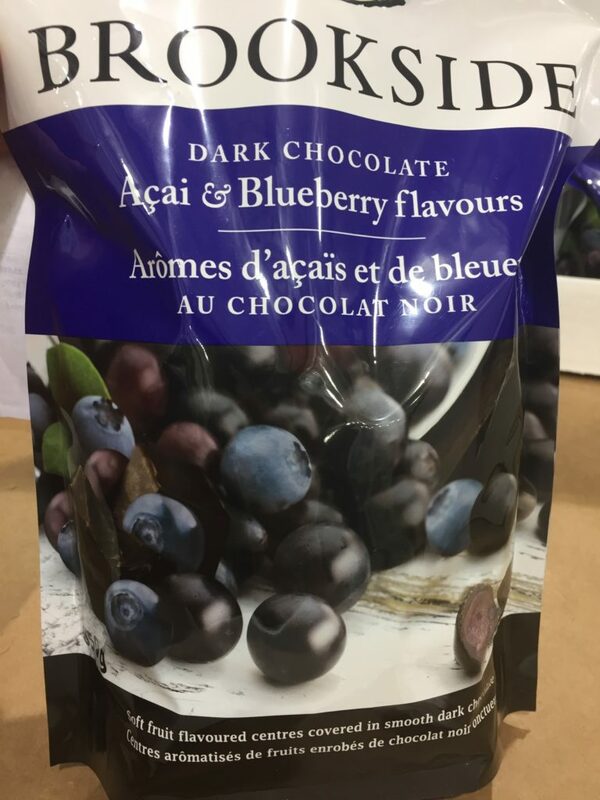 Notice it’s called “Dark Chocolate – Acai & Blueberry Flavours,” not “Dark Chocolate-Covered Acai and Blueberries.” Important distinction when you think about it, especially considering that incredibly misleading picture on the package, which appears to be bursting with blueberries. 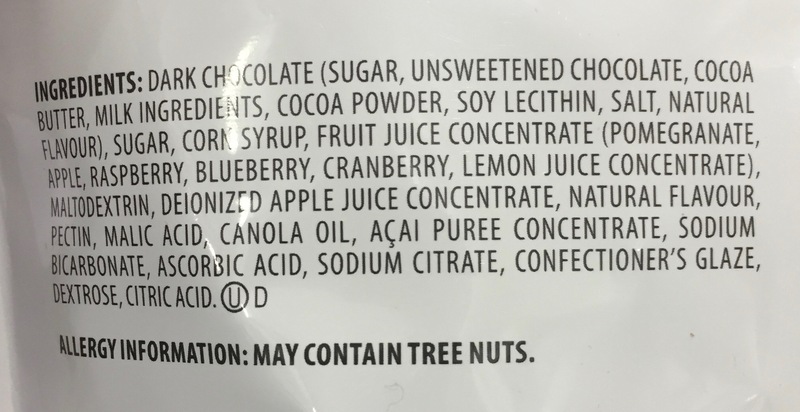 When you look at the ingredients list, after the dark chocolate (hunt for the end bracket), you see various forms of sugar, but no actual berries, dried or otherwise. Sorry, I’m not counting “fruit juice concentrate” (blueberry, among others) or “acai puree concentrate.” They’re basically fancy sources of sugar. As with chips, I’m not sure Costco is the place to buy chocolate. 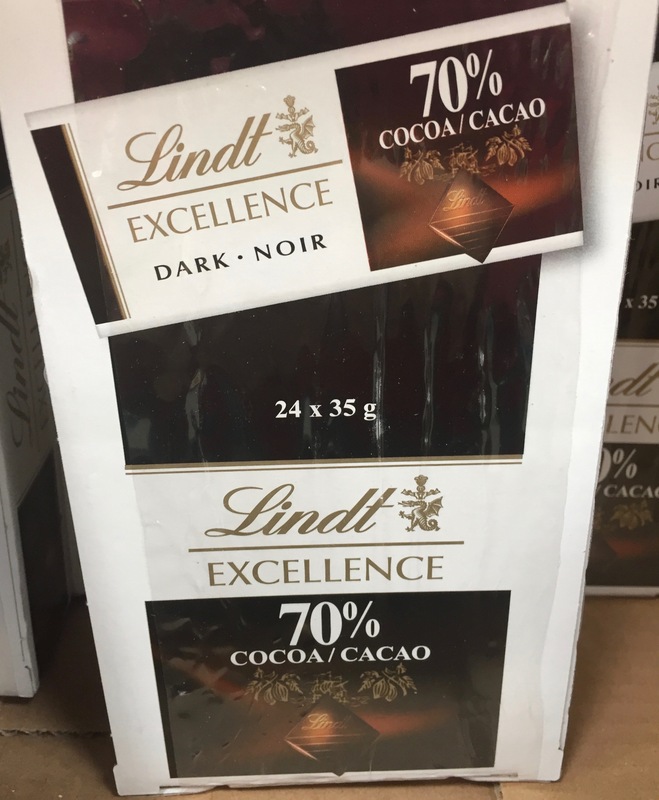 But for the sake of comparison, I’d vote for this Lindt 70% dark chocolate without all that acai and blueberry-flavoured sugar added to it. 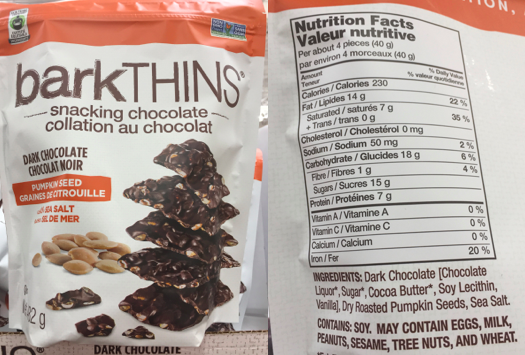 Another alternative is Bark Thins. After you get to the dark chocolate end bracket, the only ingredients left are dry roasted pumpkin seeds (or almonds and sea salt in that version). Still a treat, but with a wee bit of extra nutrition like you probably thought you were getting with the acai and blueberries. And SO GOOD. These are so good, in fact, that I’ve started buying them at Superstore instead, because the package is about a third of the Costco size. The unit cost may be higher, but the actual price is lower and we eat less when it doesn’t seem like there is an endless supply of it. This is basically a Raincoast Crisp knockoff, described as “A savoury & sweet cracker with a healthy crunch… Baked, trans fat free, low in saturated fat, 0 cholesterol.” Don’t you just want to have some every day they’re so virtuous? With crackers and other grain products, the main thing is to look for whole grains. Aim for at least half your grains to be whole. Very, very few people manage this. I’m guessing most shoppers who buy these think they’re getting a whole grain. Wouldn’t you, judging from the colour and the packaging? 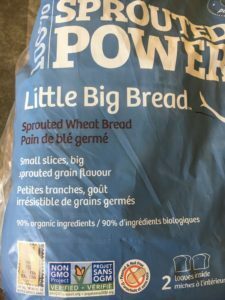 The next ingredients — brown flax, sunflower seeds, millet, and oats — are great, but we have to ask how much is really in there when the fibre is a lousy 1 gram per serving. There’s about five times as much sugar in this product, and that tells you all you need to know. Again, if you love it and want to put it out for a party, go for it. I bet they’re delicious. But don’t think you’ve got a healthy whole grain everyday food there. 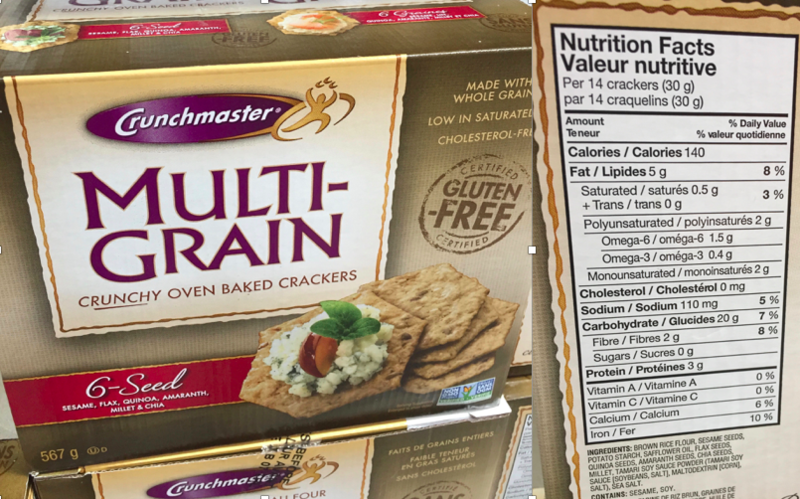 Costco sells some real whole-grain crackers, if that’s what you’re hankering for. Our favourite is the Crunchmaster Multi-Grain, but the Mary’s Originals are whole-grain too. Outside of Costco, I’ll usually grab Low-Sodium Triscuits, widely available. While we’re on the topic of sneaking sugar into your whole grains, I’d be remiss not to mention this one. Dave’s bread is actually mostly whole grain, with lots of nutrient-rich seeds thrown in for good measure, but a close look at the ingredients list reveals that the third ingredient is white flour, and there is also whole wheat flour, which is missing the nutrient-rich germ (click here for more about that subtle distinction and why it matters). So not 100% whole grain. 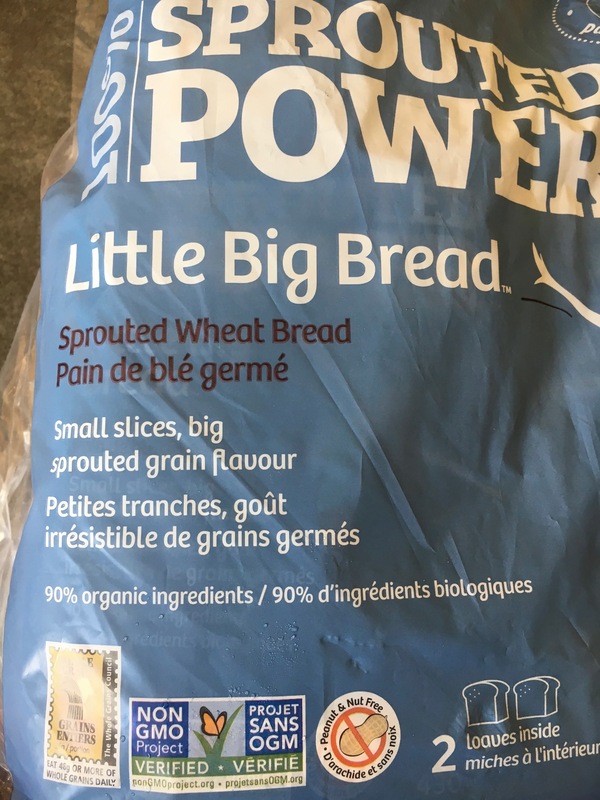 Most bread contains sugar, but it’s rare to see quite this much. Do you have some at home right now? 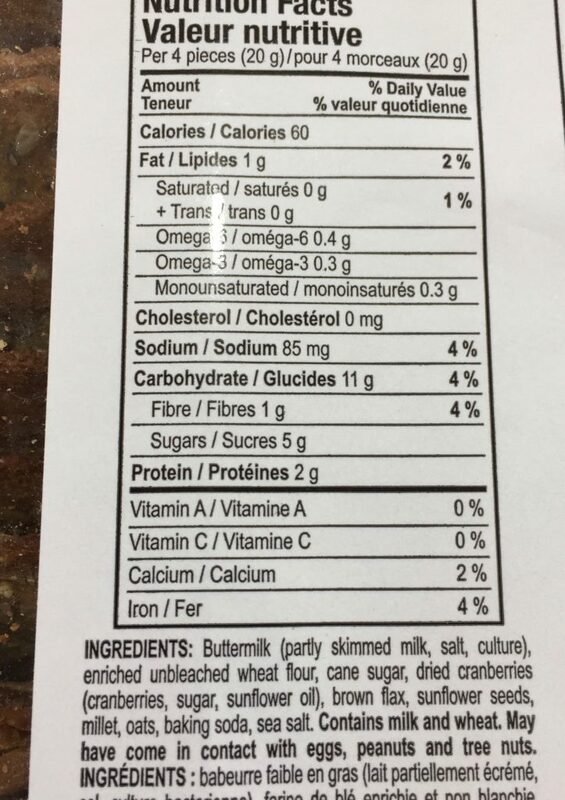 Check the label – it’ll probably be 1-2 grams of sugar per slice. If you’re sure you don’t have much other added sugar in your diet, this may not pose a problem. It probably tastes great. I just wanted to flag yet another healthwashed food that sneaks sugar in where you least expect it. 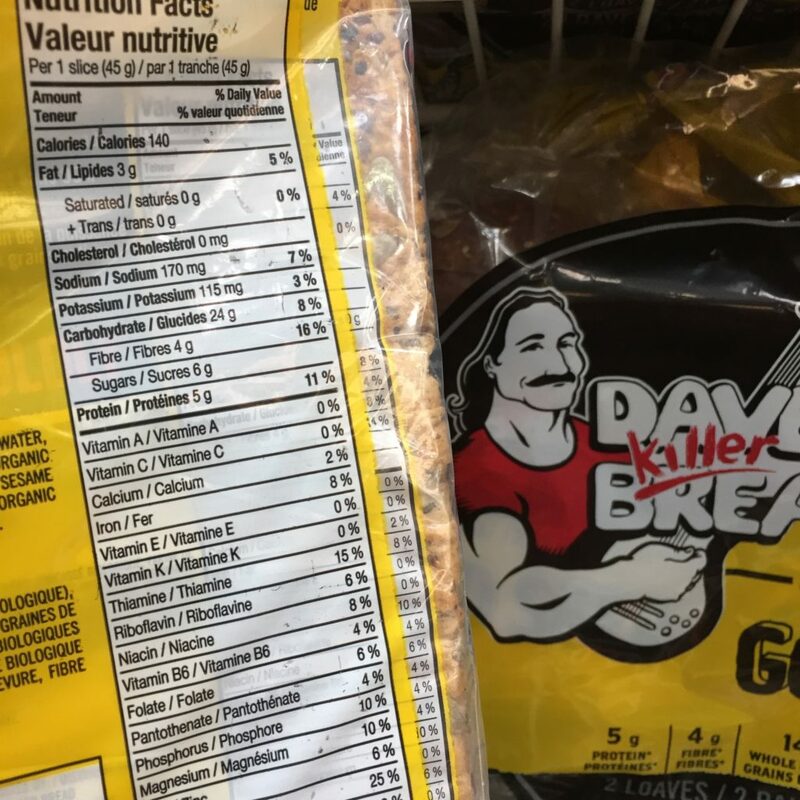 Calgary’s Costco carries both Silver Hills and Dempster’s breads, both of which are whole grains without so much extra sugar. The Silver Hills is a bit better for you, because it’s made from sprouted grain, but people either love that dense, hearty texture or they hate it. If the latter is you, Dempster’s is a decent choice too. 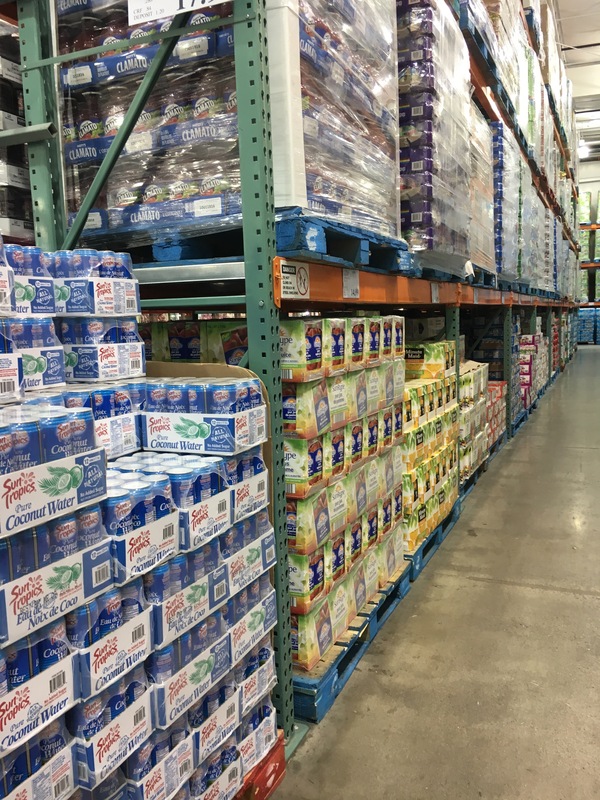 Maybe you’re planning a party, or maybe Costco’s giant selection of beverages triggered your fear of missing out. Whatever the reason, I see a lot of shopping carts with San Pellegrino Fruit Beverages (“All Natural Ingredients”) and Nestea Iced Tea (“Natural Lemon Flavour, no artificial colours”). The problem? In the neighbourhood of a days worth of sugar, or about as much as 30 jelly beans. The kicker? You’d be better off with the jelly beans, because they’d fill you up better than sugar-sweetened beverages. 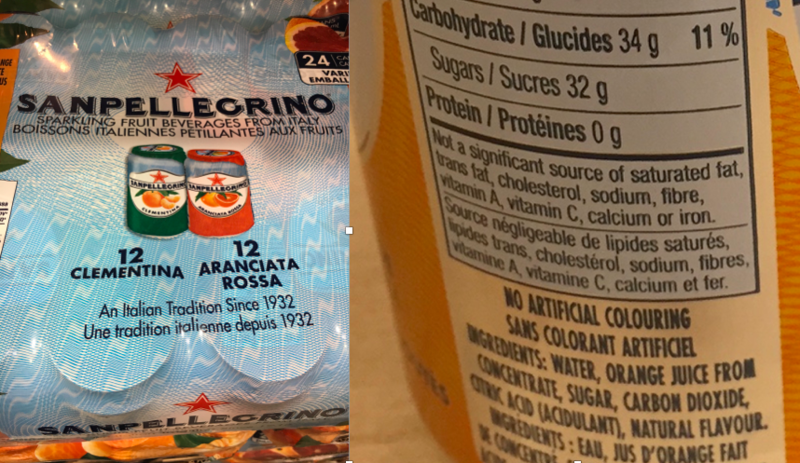 Another interesting bit of trivia: In addition to having nearly as much sugar as a can of pop, the San Pellegrino Fruit Beverage is “not a significant source of vitamin C”. If that bottle was filled with orange juice, it would have 192% of the daily value for vitamin C. Tells you about how much fruit made it into the final product. Not much! How about this one? 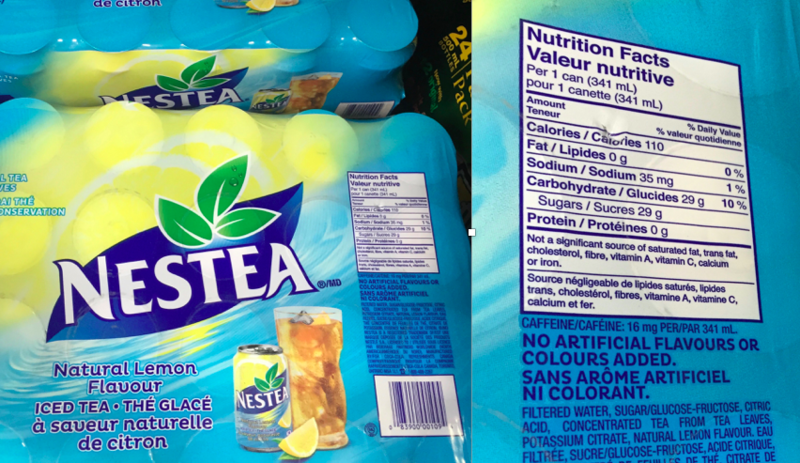 The Nestea throws around the word natural, but the second ingredient is high-fructose corn syrup (referred to as glucose-fructose in the ingredients list). Read it carefully… the product is not claiming to be natural, but rather just to have natural lemon flavour. 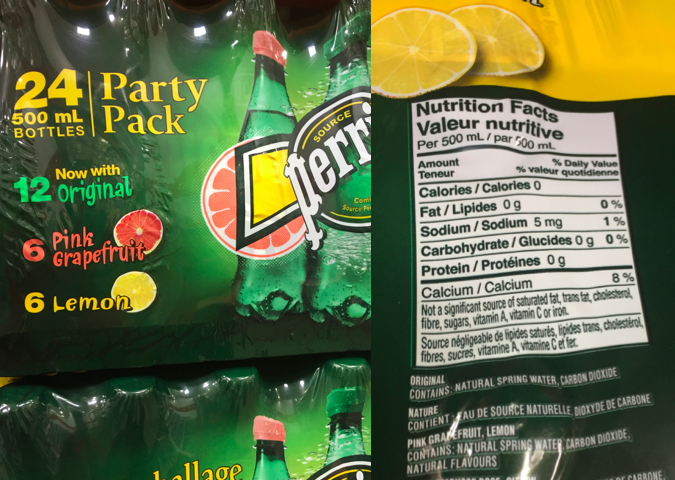 If plain water seems too boring, try this Perrier. It’s flavoured but not sweetened. Big difference on the sugar front. I could go on, but you get the idea. If you want to have a treat, be my guest. But if you’re looking for a healthy or at least healthyish choice, dial up the skepticism and read the label carefully. 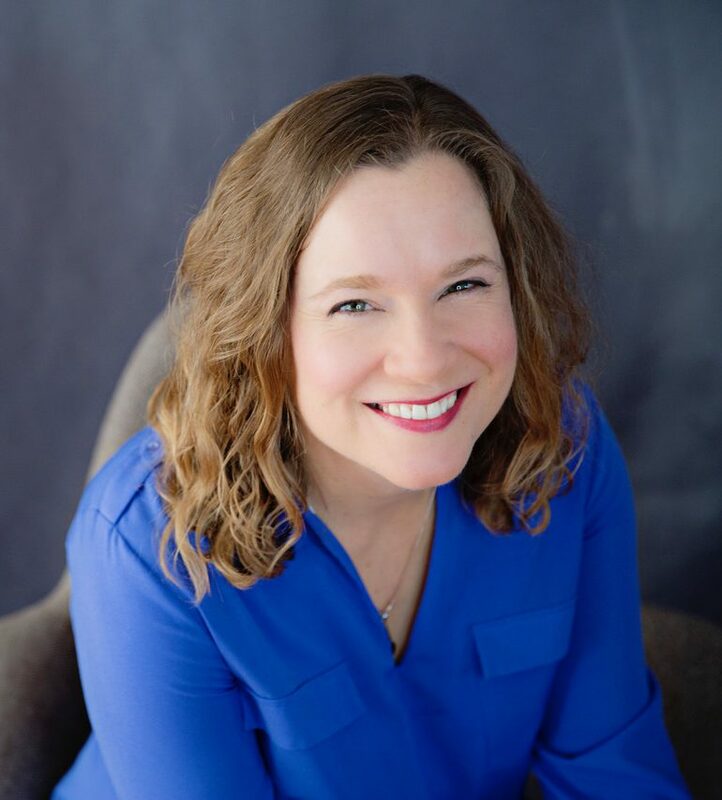 Otherwise, you might find yourself with a club-sized dose of hidden sugar or white flour in your GMO-free, organic, fruit or veggie infused snack. What about you? 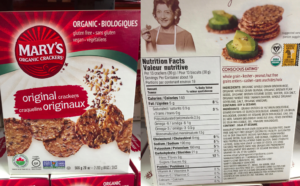 Any healthwashing pet peeves from Costco? As always, this post is not sponsored. Not even by free samples, unless you include what they give everybody at Costco, in which I’ve been known to partake. A girl needs to know the products, right?